Review data management and information security practices where you work or at an organization with which you are familiar. Recommend three specific policy changes to improve data governance, quality, integration, and security. Support each recommendation with evidence from at least two scholarly or trade publications. Review the Case sections of Ch. 10 and Ch. 11 in Modern Database Management. Analyze the data governance, quality, integration, and security at Mountain View Community Hospital. Address the strengths and opportunities for improvement in data management and security. Support your arguments with evidence from scholarly or trade publications. For either option chosen, write a 1,050- to 1,400-word paper consistent with APA guidelines. Individual Assignment Database Paper Choose one of the following assignment options to complete: Option 1: Data Governance, Quality, Integration, and Security in your organization Review data management and information security practices where you work or at an organization with which you are familiar. Recommend three specific policy changes to improve data governance, quality, integration, and security. Support each recommendation with evidence from at least two scholarly or trade publications. 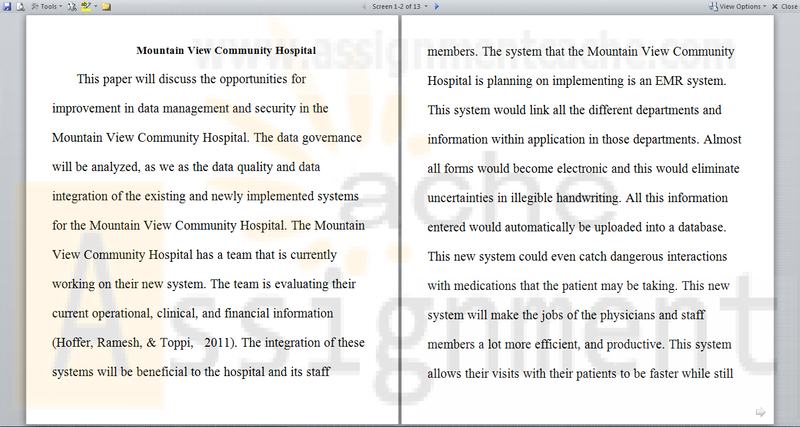 Option 2: Mountain View Community Hospital Case Study Review the Case sections of Ch. 10 and Ch. 11 in Modern Database Management. Analyze the data governance, quality, integration, and security at Mountain View Community Hospital. Address the strengths and opportunities for improvement in data management and security. Support your arguments with evidence from scholarly or trade publications. For either option chosen, write a 1,050- to 1,400-word paper consistent with APA guidelines.